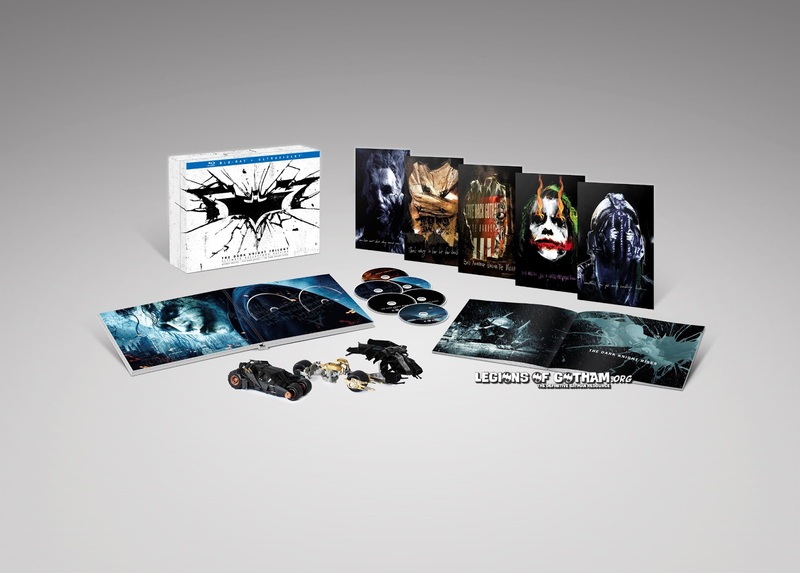 Home » Superheroes » WB Officially Announces The Dark Knight Trilogy: Ultimate Collector'​s Edition! 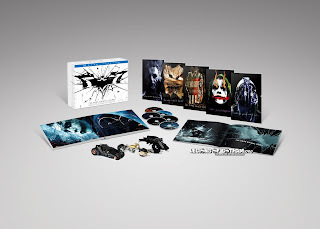 WB Officially Announces The Dark Knight Trilogy: Ultimate Collector'​s Edition! Burbank, Calif. July 1, 2013 – Christopher Nolan’s reimagining of the Batman franchise beginning with 2005’s Batman Begins enjoyed phenomenal critical and box-office success. The Fire Rises: The Creation and Impact of The Dark Knight Trilogy - The inside perspective on the fascinating story behind the creation of one of the most celebrated franchises and how it changed the scope of movie making….forever. Full of never-before-seen footage, rare moments, and exclusive interviews with Guillermo Del Toro, Damon Lindelof, Michael Mann, Richard Roeper, Zack Snyder and others. · Christopher Nolan & Richard Donner: A Conversation - For the first time, Directors Christopher Nolan (The Dark Knight Trilogy) and Richard Donner (Superman) sit down to discuss the trials and triumphs involved in bringing the two most iconic superheroes of all time to the big screen, and how Superman influenced Nolan when developing Batman Begins. Batman Begins explores the origins of the Batman legend and the Dark Knight’s emergence as a force for good in Gotham. In the wake of his parents’ murder, disillusioned industrial heir Bruce Wayne (Christian Bale) travels the world seeking the means to fight injustice and turn fear against those who prey on the fearful. He returns to Gotham and unveils his alter-ego: Batman, a masked crusader who uses his strength, intellect and an array of high tech deceptions to fight the sinister forces that threaten the city. The follow-up to Batman Begins, The Dark Knight reunites director Christopher Nolan and star Christian Bale, who reprises the role of Batman/Bruce Wayne in his continuing war on crime. With the help of Lt. Jim Gordon (Gary Oldman) and District Attorney Harvey Dent (Aaron Eckhart), Batman sets out to destroy organized crime in Gotham for good. The triumvirate proves effective, but soon find themselves prey to a rising criminal mastermind known as The Joker (Heath Ledger), who thrusts Gotham into anarchy and forces Batman closer to crossing the fine line between hero and vigilante. 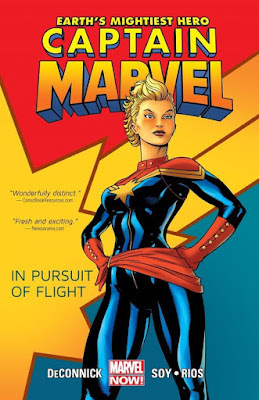 Maggie Gyllenhaal joins the cast as Rachel Dawes. Returning from Batman Begins are Oldman, Michael Caine as Alfred and Morgan Freeman as Lucius Fox. But everything will change with the arrival of a cunning cat burglar with a mysterious agenda. Far more dangerous, however, is the emergence of Bane, a masked terrorist whose ruthless plans for Gotham drive Bruce out of his self-imposed exile. But even if he dons the cape and cowl again, Batman may be no match for Bane. Christian Bale stars, along with Michael Caine, Gary Oldman, Anne Hathaway, Tom Hardy, Marion Cotillard, Joseph Gordon-Levitt and Morgan Freeman. ® & © 2009 IMAX Corporation. All rights reserved. Warner Bros. Home Entertainment (WBHE) brings together Warner Bros. Entertainment's home video, digital distribution and interactive entertainment businesses in order to maximize current and next-generation distribution scenarios. An industry leader since its inception, WBHE oversees the global distribution of content through packaged goods (Blu-ray Disc™ and DVD) and digital media in the form of electronic sell-through and video-on-demand via cable, satellite, online and mobile channels, and is a significant developer and publisher for console and online video game titles worldwide. WBHE distributes its product through third party retail partners and licensees, as well as directly to consumers through WBShop.com and WB Ultra.